I love to draw mainly sonic characters and other anime characters. My favourite anime(s) is Sonic X, Dragon Ball, Dragon Ball Z, Dragon Ball GT, Blood +, Death Note, Zero No Tsukaima, Gravitation And Many More. 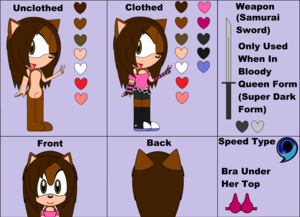 I am the creator of Queen Silvia (Fan Made Sonic Character). She Is A Super Ultimate Life Form. She May Look Sweet And Innocent But She Is A Really Powerful Creature Her Destiny Is To Protect Shadow, Sonic And Her Other Friends.